Skink is the common name for the lizards that comprise the family Scincidae and that typically are smooth and shiny with small or rudimentary legs. Skinks are the most diverse group of lizards, with about 1,200 known species. Skinks play important roles in food chains, consuming insects and other invertebrates, and some vertebrates (rodents, lizards) and serving as a source of food for a wide range of predators (birds, snakes, foxes, raccoons, etc.). Some skinks can be vectors of human diseases, such as the five-lined skink that acts as a host and carrier of the common chigger that regularly attacks humans (Fitch 1956; Vanwormer 2002). However, in general, skinks provide benefits to humans both in controlling insect and other invertebrate pests (Harding 1997) and in adding to the wonder of nature. Their uniqueness can be a source of delight for people, such as the escape mechanism of some skinks whereby the brightly colored tail is shed and twitches, distracting the predator while the skink runs away (Vanwormer 2002). As members of the order Squamata (lizards and snakes), skinks have a lower jaw that is not joined directly to the skull, scales, and the presence of paired reproductive organs in the male (Towle 1989). As lizards (suborder Sauria or Lacertilia), skinks have less flexible jaws than snakes, movable eyelids, and external ear openings. In some skinks, the eyelids are transparent, allowing them to see even when the eyelid is closed. Skinks make up the family Scincidae, which shares the superfamily or infraorder Scincomorpha with several other lizard families, including Lacertidae (the "true" or wall lizards). Scincidae is the largest of the lizard families in terms of species diversity. Skinks look roughly like true lizards, but most species have no pronounced neck and relatively small legs. Several genera (e.g., Typhlosaurus) have no limbs at all. Others, such as Neoseps, have only reduced limbs. Often, their way of moving resembles that of snakes more than that of other lizards. 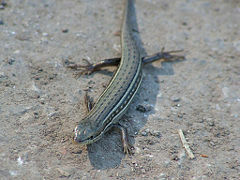 Skinks usually have long, tapering tails that can be shed and regenerated. Skinks typically have elongate, cylindrical bodies, and smooth, shiny, overlapping scales (Lindsey 2007). Most skinks are medium sized with a maximum length from the snout to the vent of some 12 centimeters (cm), although there are a few that grow to larger sizes, such as the Corucia, which can reach 35 cm from snout to vent. Skinks are found in a variety of habitats worldwide. Many species are good burrowers. There are more species of terrestrial and fossorial (adapted to digging and life underground) skinks than arboreal (tree-climbing) or aquatic species. Some are "sand swimmers," especially the desert species, such as the Mole skink in Florida. Most skinks are diurnal, so they are active during the day. They like to crawl out on rocks or logs to bask (soak up heat from the sun) during the day. A number of species of skinks are considered Endangered species. Skinks are particularly abundant in Africa and Indoaustralia (Lindsey 2007). Skinks are generally carnivorous and largely eat insects, including crickets, grasshoppers, beetles, and caterpillars. They also eat spiders, earthworms, snails, slugs, isopods, other lizards, and small rodents. Some species, particularly those favored as home pets, have a more varied diet and can be maintained on a regimen of roughly 60 percent vegetables/leaves/fruit and 40 percent meat and meat products (cat or dog food) (McLeod 2006). Raccoons, foxes, opossums, snakes, cats, moles, and birds (hawks, crows, etc.) all prey on skinks. During the breeding season, some types of skink will exhibit orange or red markings to indicate sexual maturity. About 55 percent of the skinks are oviparous, that is, they lay eggs in small clutches, with little or no other embryonic development within the mother. The other roughly 45 percent are ovoviviparous, where the embryos develop within eggs that remain within the mother's body up until they hatch or are about to hatch. Unlike the embryos of viviparous species (live birth, where the embryo develops in the mother's body), ovoviviparous embryos are nourished by the egg yolk rather than by the mother's body. Many large genera, Mabuya for example, are still insufficiently studied, and systematics is at times controversial, see e.g. the taxonomy of the Western Skink (Eumeces skiltonianus). Fitch, H. “Life history and ecology of the five-lined skink, Eumeces fasciatus.” Pp. 1-156 in E. Hall, A. Leonard, and R. Wilson, eds., University of Kansas Museum of Natural History Publications, Volume 8. Topeka, Kansas: University of Kansas, 1956. Lindsey, I. Skinks Kawea Hoaks, 2007. Retrieved September 20, 2007. McLeod, L. Keeping blue tongued skinks as pets Exotic Pets, 2006. Retrieved September 20, 2007. Vanwormer, E. Eumeces fasciatus Animal Diversity Web. Retrieved September 20, 2007. This page was last modified on 2 April 2008, at 16:32.